I get asked a lot about how long certain greenhouse coverings will last. The thing is, the limit of the warranty does not equal the life expectancy of the material. I will address the following materials – 6 mil, 4 year polyfilm, reinforced polyfilm and polycarbonate sheets. I will be mentioning the UV protection. That is what keeps the materials from getting brittle, cracking, or turning yellow. The warranty will typically cover how long the manufacturer expects the UV protection to last, or it may refer to how much the UV protection may change in a certain period of time. Greenhouse polyfilm is typically listed by the thickness and the length of the time that the UV protection is warranted for. 6 mil, 4 year polyfilm is 6 mil thick and has a UV protection that is warranted for 4 years. But, that does not necessarily mean that it will last the entire 4 years. The material will not get brittle, etc, but if it is damaged (due to a falling limb, hail, etc) there is a possibility that the cover will be lost. There is patching tape for the film coverings, but if you are not at the greenhouse when the damage occurs it may be too late to stop it. This will be the least expensive of the greenhouse glazing choices and is excellent for small hobby or commercial greenhouses. Although most of the commercial greenhouses will use a double layer of this film with a blower that blows air between the 2 layers. This will definitely increase the insulation factor for this material. I have had some growers report back to me that they feel the film is less likely to be damaged when using this double layer. They feel that the air between the layers “stretches” the film, making it tighter and less susceptible to damage from falling items. The reinforced polyfilm is 2 layers of film laminated together with a rip stop feature in between the sheets. This has a one year warranty on the UV protection. But, we have had reports back from people who have gotten up to a 12 year lifetime from this material. The rip stop feature is what makes this possible. If the film does get a tear it cannot go any further than the cords of the rip stop. That will keep the area of the rip limited, and it is easily repairable once it is found. Polycarbonate sheets are a rigid material. Many manufacturers offer a 10 year warranty that the light transmission will not vary more than 10%. The change in the light transmission is what causes the sheets to get brittle, yellow and crack. There are, however, some manufacturers out there now offering a comparable 20 year warranty. Please be sure to check with the company supplying you the sheets to see which warranty is offered. Polycarbonate is a tough material and typically has a 10 year warranty against hail damage. So, tearing or damage to the sheets is not near as big an issue as the polyfilm. In fact I have been dealing with polycarbonate sheets for over 20 years now and have never been involved in a warranty claim. I have had many people in the industry report back that they have seen polycarbonate sheets (with the 10 year warranty) last up to the 20 year mark. I personally have seen the 10 year warranty material remain usable at 15 years. 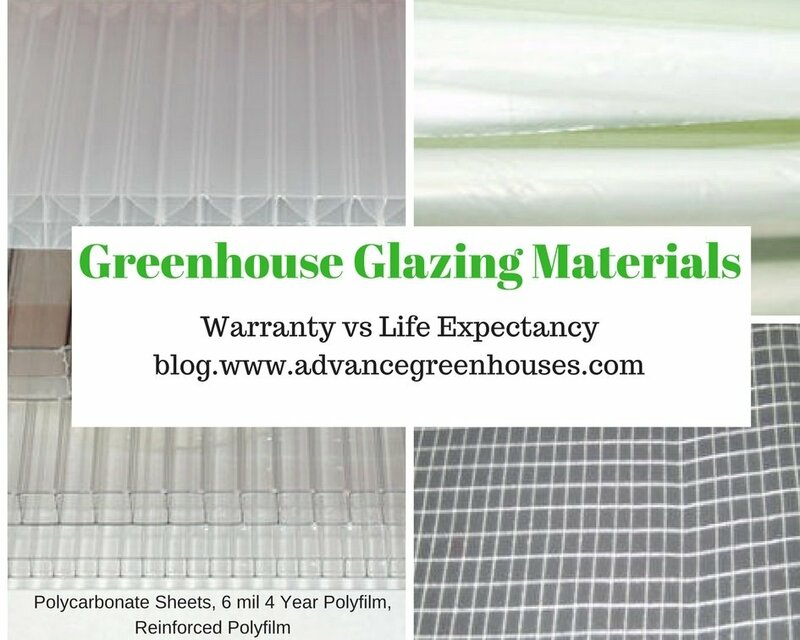 Hopefully this overview of the warranties and greenhouse glazing materials will give you the information you need to make the best decision for your greenhouse.